The OTIS Club Newsletter Thing is the main perk for members of the OTIS Club, an inner circle of awesome OTIS readers. It comes out every week, and for as little as $1.00 a month, you can join the club. Issues are delivered through Patreon, but since Issue 105 was a free and open-to-the-public one (in celebration of the two-year anniversary of the club and 105 straight issues of the newsletter), I'm reproducing it here. The death date on this slate was 1802. After last weekend’s trek up the entire Maine coast, I figured this week would be a purposefully uneventful one as far as OTIS-y things go. Turns out, I actually slipped some solid oddity into my life this week. On Tuesday, I visited the Phipps Street Burying Ground in Boston for the first time. My office recently moved from Cambridge to Charleston, which is a Boston neighborhood not too far from Bunker Hill. So I’m trying to take advantage of the new base when I’m there and see what’s around. Phipps Street was around. It’s one of Boston’s famous 17th century burial grounds, but less known than Copp’s Hill or King’s Chapel or the Granary since it’s not on the Freedom Trail. Like all of Boston’s fantastic 17th century rotyards, its tombstones were extremely skull-y. Usually the typical winged skull, but each one slightly different as far as the embellishments around the skull. Below is one of the unique tombstone carvings in the yard. The Masons, you know? Saturday, I went to Cambridge to check out a production of Sweeney Todd and swung by a restaurant/bar called the Grendel’s Den. I just wanted to see the logo. After all, how many eateries are named after monsters from old English lit? I posted photos of it on the socials. And then on Sunday, we went to Salem. I’ll save the details of that jaunt for the next section. This week on the OTIS Map of Oddities, no real progress. We’re at more than 3,200 sites across the U.S., with only eight more states to fill in for the “base coat” of oddities for the map. Also, don’t forget my next appearance is on Sunday, June 17th (Father’s Day). I’m giving a talk at the 1699 Winslow House in Marshfield, Massachusetts, about how I find oddity and string them together into a day trip. By the end of the talk, I’ll have assembled an entire journey of cool stuff in the area that anybody can take. My next real trip comes up at the end of the month. It’ll be to Maryland. And then, if everything goes as planned, we’ll be doing a massive trip at the end of July. Stay tuned for news as I finalize that. It’ll be a cool one...if it works out. The stuff you see in Salem...almost any time of the year. Sure, the calendar said June 3, but the temps were in the early sixties. It was a fall day, despite what the white squares with the numbers in them claimed. Which was perfect because we were headed to Salem. Some days, we just want to visit Salem. It’s that kind of town. We don’t do it much different in the summer than we do it in the fall. And, these days, the city itself is almost the same during those seasons. We saw people dressed as witches. Street performers. A haunted house was open for biz. So were the witch shops. And the witch attractions. Halloween items were everywhere. All the city needed as about 70% more people and Haunted Happenings banners on the poles. We wandered around, jumped into Wynott’s Wands because my eldest just finished reading the Harry Potter series and we’re at the merch point in the Harry Potter Cycle (booksàmoviesàmerchàUniversal Studios). A wait at the Lobster Shanty meant we ate at our ever-Plan B restaurant Rockafellas. We watched passersby on Essex St. and discovered a cinnamon-cranberry cocktail that I’ll need to put on my drink list come fall. A lot is changing in Salem. There’s a boutique hotel on Essex St. now: The Hotel Salem. It touts a roof bar, and if that means a view of Essex street from above, that’ll be amazing in October…if you can get in. The Peabody Essex Museum is finishing its expansion on Essex St., adding to the modernization (for good or ill) of the strip. Exterior of the Peabody Essex Museum expansion. My favorite change to Essex St. is that Count Orlok’s Nightmare Gallery is moving there from Derby St. It’s a more prominent locale for the movie monster museum, and I can’t wait to see its incarnation when it opens. But some things never change, like the Old Burying Point and the Witch Trials Memorial, which is where we finished our day in downtown Salem, as we always seem to do. June 2013 — I’ve written about a lot of dinosaur attractions on OTIS, but I’ve never written about our visit to The Dinosaur Place in Montville, Connecticut. No good reason. It just fell into my backlog and never escaped—like so many oddities, unfortunately. By the way, this photo was taken two years before Chris Pratt did it in Jurassic World. Usually, this section is about the latest book I’m reading, movie I’m watching, or oddity I’m researching. It’s also here where we do the OTIS Club giveaways. 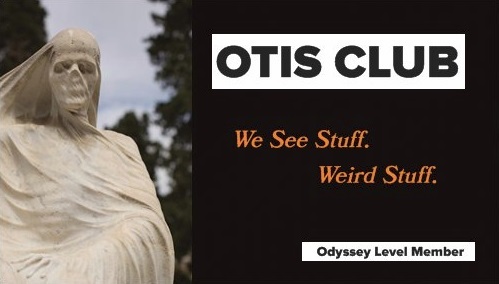 Since this issue is public, though, I wanted to encourage people to become OTIS Club Members. We’ve been doing it for two years now, and that should tell you something important about the club and its members. Personally, I think we need more $1 and $3 members (Quick Jaunt and Day Trip levels, respectively). At those levels, you get one or two of the issues per month, respectively. Way worth it for the oddity-minded, right? To get this newsletter every week, access to the interactive OTIS Map of Oddities, and other perks, consider joining at the Road Trip level ($5). If you’re an elite reader, we have the top tier levels, Globe Trek and Odyssey ($10 and $20, respectively). Join this month and get access to all of May’s issues, as well. I cannot wait to show you around the club. Respectively.